After dozens of campaign appearances around the country and six stops in Indiana this week, Chelsea Clinton was ready to defend “mom” Hillary Clinton’s presidential campaign when she arrived in Indianapolis. 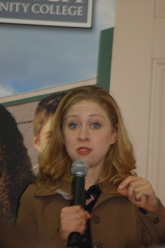 Chelsea Clinton’s appearance at Ivy Tech came four weeks before the Indiana primary and one day after the final day for voter registration for the primary. It attracted an audience of about 300 people, mostly students who wanted to know what the Clinton campaign had to offer them. “I haven’t fully made up my decision. That’s why I’m here,” said Jaclyn Wall, 24, a science student who was one of the first in line and waited more than an hour for Clinton’s speech. Also undecided was Jim Ikerd, 53, a welder and non-student who lives in Brazil, Ind. and works in Avon. “There is some stuff I’m hearing about Hillary and I want to clear up some things,” he said. 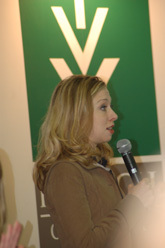 During an hour of speaking to the audience and answering their questions, Clinton, 28, spoke about her mother’s proposals to make health care and prescription drugs more affordable, to expand the Pell grant program of college scholarship assistance, to stop mortgage foreclosures for 90 days and help U.S. automakers produce more fuel-efficient cars. When asked if Barack Obama represented a new wave in politics and her mother represented old ways, Clinton replied that “mom” was the best candidate to make the changes wanted by people because of her experience in the U.S. Senate. “Not only is my mom a fighter when she has to be, but she also finds common ground,” Clinton said about her mother’s ability to work with conservative Republicans in the Senate. While Clinton supporters such as Judy O’Bannon, wife of the late Gov. Frank O’Bannon, have spent recent days visiting senior citizen centers, Chelsea Clinton has been campaigning at college campuses. The daughter of former President Bill Clinton and the current candidate has spent most of the week in Indiana, with stops since Sunday in East Chicago, Lawrenceburg and West Lafayette. The Indianapolis appearance was Clinton’s third Indiana stop of the day, all at colleges. She began today at the University of Southern Indiana in Evansville, traveled east to Indiana University Southeast in New Albany and then headed north to Ivy Tech in Indianapolis.